KnittySue is having a contest over here, it's easy peasy to enter. Just become a follower and post about the contest. You have until 1 June 2009. My knitting feels somewhat unproductive lately... making some progress, yet never quite finishing. I chipped away at the pink lace scarf, no real visible progress made; last seen on 01Dec08, better photo in 02Nov08 post. I've already finished one half. I'm working on the second half and hoping to finish soon, then I'll graft the two pieces together so that the motif looks right-side-up when the ends hang in front. I chipped away at the red cable scarf, also no real visible progress made; last seen on 19Feb2008. 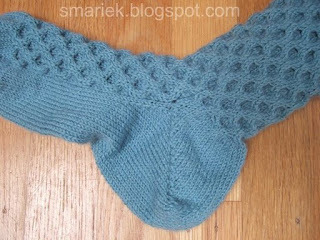 Like the lace scarf, the 1st half is completed and I am slowly working through the 2nd half. This one also needs to be grafted at the center. You do realize what this means, right? When both halves of both scarves are completed, it will take even longer for me to work up to grafting them. Sock 1 & Sock 2 were constructed differently. Sock 1 has an underfoot heel flap plus gusset. Sock 2 has SRH. There's a better photo below. I wanted to try SRH again after my failed attempt on pink Pair 2. My 2nd attempt wasn't exactly smooth, you recall the booboo I made and had to tink back to fix it? I thought it would fit OK, but after trying on the sock after completion, I've decided that I could have tinked back to 20 or 22 center sts for a better snugger fit. 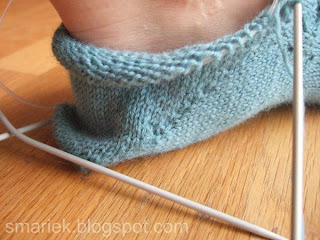 The heel doesn't look too bad when the sock is lying flat. It actually looks quite neat. I still haven't decided whether the 12 st incr before starting the SRH contributed to my "problem" with SRH fit. Perhaps it would have worked out better if I just left the sts alone and worked on 32 sts instead of 44 sts. I worked 4 pattern repeats (after SRH) before switching to 3.0 mm needles for the remainder of the leg. Then I switched back to 2.75 mm for the cuff, because it seemed loose on Sock 1 using 3.0 mm needles ... although it's not a fair comparison when I have 64 sts on Sock 2 and 96 sts on Sock 1. 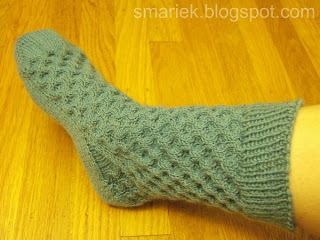 Anyhow, I am pleased with how it turned out on Sock 2 with 2.75 mm. Here you can see how the heels are different on each sock. -- End rnd 7 ? -- K1P1 12 rnds 1.5"
Well, now that I have finished Pair 5, I suppose I should get back to red Pair 4. I finished Pair 4 Sock 1, and need to figure out where I left off on Sock 2 ... 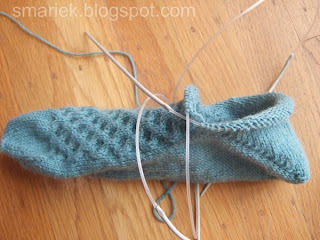 I think I was about to pick up heel gusset stitches. I am tempted to begin another pair of "mindless" socks, but I have told myself that I must not CO for Pair 6 until I finish one of the 2 scarves or the red socks. I know what would happen if I did CO for Pair 6 ... the other 3 would continue to languish in UFO limbo. I've already decided that Pair 6 would be variagated. Since I have already made a pair of K2P2 rib, I was thinking of trying either K1P1 or K3P1. Yay, I have finally finished reading this historical fiction. I muddled through the end. This means I can finally begin this popular young adult novel which I keep hearing about. I haven't made too much of a dent in it, E has already saved Bella's life (from an auto accident) and I've just gotten to the beach party. This book is moving along much faster than the previous book. I saw this SciFi movie earlier in the week and loved it! I was not sure what to expect, not having overly high expectations due to it being an "odd" numbered film. I was pleasantly surprised, it was very good. The movie was lots of fun and I wouldn't mind seeing it again. I also thought the movie was well cast. 1. If we had no winter __California would prolly be in a worse drought___. 2. __Life is___ a perpetual astonishment. 3. If I had my life to live over _I like to think I'd do it better____. 4. _I never get enough knitting done____ inside of four and twenty hours. 5. If you've never been thrilled _go ride a rollercoaster____. 6. To be interested in the changing seasons _you must notice and appreciate the differences____. 7. And as for the weekend, tonight I'm looking forward to _planning my next mini vacation, possibly here____, tomorrow my plans include _watching Dark Knight and/or Torchwood 2nd season, doing a little knitting, and making more progress in Twilight____ and Sunday, I want to _stay cool (we have a heat wave, forecast high of 99!)____! Pair 5 Sock 2 is coming along nicely compared to Sock 1, despite a trip back to the pond. I've started Sock 2 of Practice Pair 5. You saw Sock 1 here. Of course I had to take this opportunity to try something different. I decided to give SRH another try. 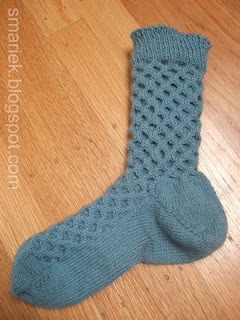 This would be my 2nd try after my first failed attempt with pink sock Pair 2. Since the SRH came out short with the pink sock, I decided to compensate by knitting the foot longer before starting the SRH. I should have stuck to this, but noooooo, I had to add one more change. I also increased 12 sts before starting the SRH (incr 2 st ev other rnd). And I worked the SRH until I had 12 sts left in the center before turning aronud. My sock looked like this after completing the whole SRH dance. My sock looks weird, huh? 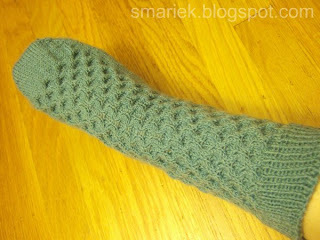 Here's a close up look at the heel. Notice how the back protrudes in an odd way? Yeah, that's the problem. Perhaps it'll be more obvious when you see it on my foot. I'm not sure where I went wrong. Surely it was a combination of working SRH on 44 sts instead of 32 sts, plus starting the SRH later in the foot. I had knit the foot for 7" before starting the SRH. Perhaps I should have stopped at 6" or 6.5" instead. So what might have made this SRH work? I dunno. All I am certain of is that this SRH is not going to work for me. I am not wearing a sock with excess flab hanging off the heel. I can't believe it took me 2 hours to fix my SRH. 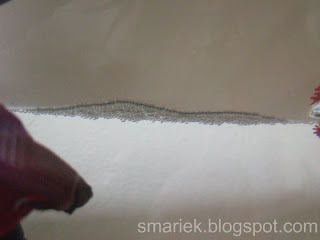 I didn't know how to stick a needle through my SRH (like a "lifeline", see links in sidebar under Knitting Resources section) because of the extra stitches hanging off to left & right of the center stitches. So I ended up tinking back, one stitch at a time. It was a slow process, especially when the yarn would sometimes "stick" to adjacent strands. I brought it back to 18 center sts (I think) before turning around to go forward again. I think I could have gone another 2 sts (to 20 sts) for an even snugger fit. But I am happy with this 2nd attempt, and am not going to tink back again. I can see this will fit better than the 1st attempt. 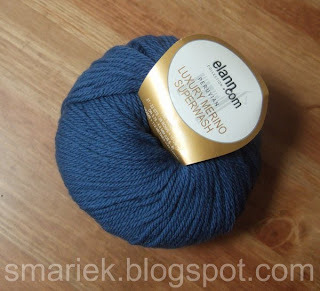 I am sad to see my favorite yarn from E going away for good. This became my favorite DK weight yarn after they discontinued the Highland Silk. E is having a bag sale on the remainder of their stock and they have remaining single balls here. Only 3 colors left in bags; they started with only 5 colors, so you missed the cream and purple. I've made 10 scarves from this yarn (this one in regency rose and ruby; this one in ruby; this one and that one in tapestry blue; this one in cafe au lait; this one in irish moss; this one in viola phlox; this one in merlot; and this one in capri blue. So I guess I really liked this yarn! Sigh... now I need to find a replacement (nevermind that I had already stocked up on quite a bit over the years and don't need more DK weight yarn). I am nearly finished with this historical fiction and I find myself slowing down a bit because I know that it does not end well for the protagonist. Time to do another load of laundry, have some lunch, and return books to the library. Hope everyone has a wonderful weekend! 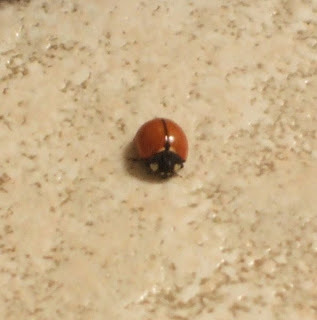 Just a couple of pics of a ladybug I found crawling on my kitchen floor. 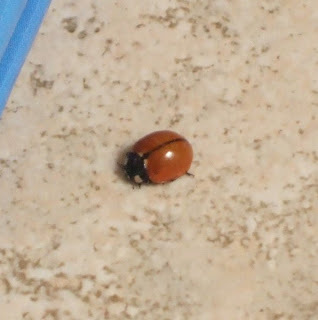 The odd thing is that this ladybug has no spots! 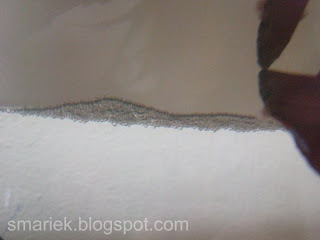 It was hard for my camera to focus on something so tiny, so the pics aren't very clear. It seemed easier to take a photo of the other ladybug from June 2008. I let him crawl around in my kitchen for a little bit, and then I scooped him up and placed him outside where he may find things more interesting. It's been decades since I started learning French. I took French for 2 or 3 years, probably 3. Then my French studies were neglected, or I'd revisit them on and off over the years. One thing that was always a challenge was trying to learn how to conjugate all those verbs! 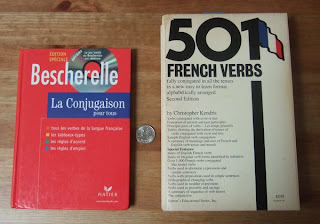 When I was first learning French, 501 French Verbs was a ubiquitous French verb book available in nearly every bookstore. It was a relatively large reference book, not something you'd want to lug around with you everywhere. But what does one do when it is all that you've got? BTW, the quarter that is most visible in the first photo at the top of this post is supposed to help with sizing. I actually have TWO copies of the 501 French Verbs book! 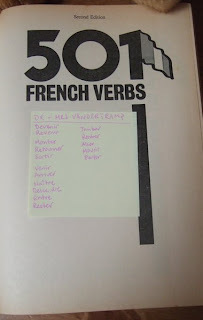 Inside one of them, I discovered this post-it note, a little "cheat sheet" for learning which verbs take "être" instead of "avoir" in the passé composé. It says: D R & M R S V A N D E R T R A M P.
This is a typical page in 501 French Verbs, it is the page for the verb finir (to finish). 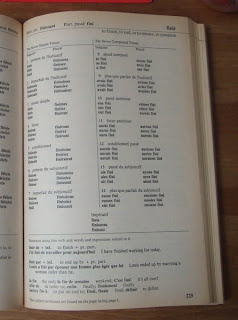 The page shows you how to conjugate the verb in the various tenses. Now let's say you want to know how to conjugate the verb s'évanouir (to faint). 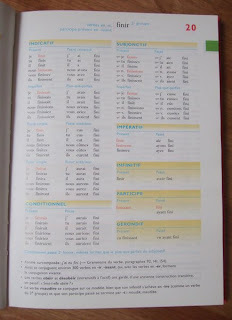 This is the page for the verb s'évanouir in 501 French Verbs. Yes, it has its own complete page devoted to this one verb. The book has one page for each and every verb in the book. Now do you see why 501 French Verbs is such a thick book? So now you must wonder, why is Bescherelle so thin? Is the print as miniscule as the Oxford English Dictionary??? No, you don't need a magnifying glass to read Bescherelle. But I'll show you how Bescherelle works! 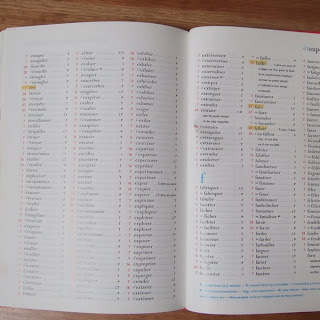 Here is a typical page in Bescherelle, it is the page for the verb finir -- and it is verb #20 in the book (note the red "20" in the upper corner of the page). 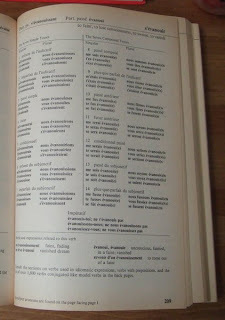 Here is a typical INDEX page in Bescherelle. Now let's say you want to find out how to conjugate the verb s'évanouir in the 1st person subjunctive. What do you do? Well, you go look up the verb in the index! Here is the subjuctive section of verb #20. It shows you that finir would be conjugated as que je finisse. To apply the rules and endings of French verb conjugation, we can use this "model verb" to conjugate s'évanouir as que je m'évanouisse. Ok, I've just realized that using s'évanouir was a bad example because it is a reflexive verb, and perhaps it isn't as evident to you how to apply the rules for finir to conjugate another verb. Ok, here's another verb example. Let's take the verb étourdir (to stun). It's the 3rd verb in the left column of that same index page. You'll find a "20" to the left of the verb, which refers you to the same page for finir. Applying the conjugation rules from the "model verb" finir, you can figure out that the 1st person subjunctive for étourdir would be que j'étourdisse. Anyhow, I found it easier to learn/remember how to conjugate verbs by grouping verbs together which are similarly conjugated. I think Bescherelle helps with this. Georgi is having a 200th post contest, go check out her contest over here. You have until 17May2009 to enter. Darcy is having a contest too, go check out her contest over here. You have until 15May2009 to enter. Last week I mentioned test knitting something for Dianna. 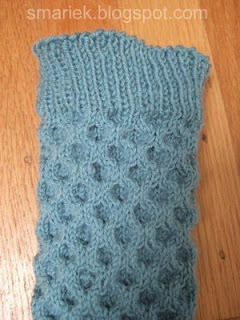 I finished knitting it on Tuesday night while watching Little Dorrit. I had never read this book before and wonder why I had never heard of it before. Why isn’t it more popular or as well known as his other novels? I enjoyed the miniseries and I will have to read the book someday. Anyhow, the mitts came out well, nice and snug for my petite hands. What a refreshing change to knit on 4.5 mm needles after using 2.25 mm to 2.75 mm! I can't show you photos of the finished pair of mitts until June when the KAL begins in this RavGroup. Now that the mitts are done, I guess I have no excuse to avoid sock knitting. Should I work on the red one or the blue one? The blue one was last seen on 24Apr2009 here, and the red one was last seen on 18Apr2009 here. I'm inclined to go with the blue ones on 2.75 mm needles. Hope I can remember where I left off. I was in the middle of some inelegant increases when I set it aside for test knitting the mitts. 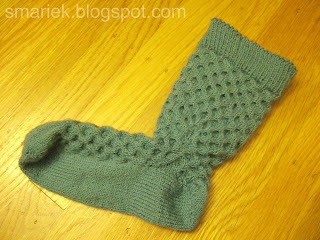 Scroll down to find out how the sock turned out. Bets has found a nice knitted cabled top and I wonder if it is something easy enough for me to finish. It's really pretty, although I'm not sure I like the sleeveless look because I don't have pretty shoulders/arms. Will need to look for a suitable yarn, I'm thinking about Bamboo Fusion, in Garnet or Wisteria. Discovered the free pattern is here. I can't knit from chart, so I'd have to convert that to row instructions. --. . --- .-. --. . 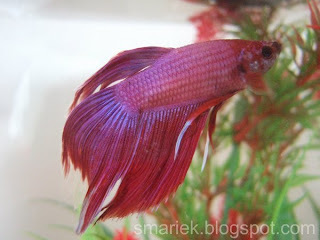 If you look carefully, you'll see that part of his tail fin is transparent near the ends. 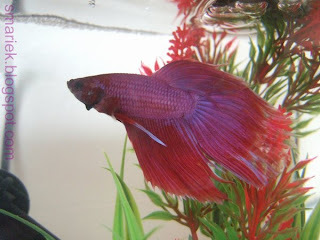 So his tail looks short if you are just looking at the purple parts. He came with some scrapes and splotches on his head. On his right face, you'll see that it looks like some scales are missing there. I wonder how long this will take to heal. I hope he isn't bothered by it too much. He's very cozy now that he has a 25-w submersible heater in his tank. It is currently set to 79°F. Unfortunately this heater takes up quite a bit of real estate in his little 7.57 litre (2gal) tank. These two photos were taken last week. 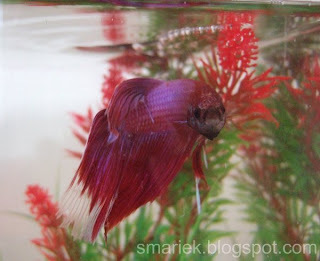 He's perked up this week and his coloring is much more vibrant; I think it is a side effect of having a heater. I think this is the start of a bubble nest! I think they make these when they're happy. This past week blew right by. It started with a crappy weekend when our water heater broke and we had no hot water for about 3 days. Why couldn't this have happened one week earlier when we were in a heat wave? We were quite miserable. It was a busy/tiring week and very little knitting got done. I'm trying to catch up with the knitting this weekend since we're not making a trip to the EB. I was definitely up and about during the week, but I never really felt quite all there. It was as if I weren't fully awake. Ever feel that way? And here we are with the blue sock, the 1st one of the pair. Yeah, it looks a bit pinched in around the ankle. Then there were some inelegant increases. 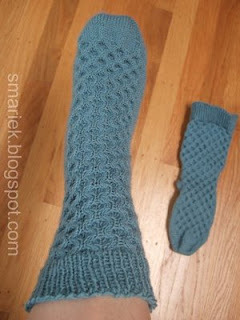 I will try to make some improvements to the 2nd sock so that it fits better. 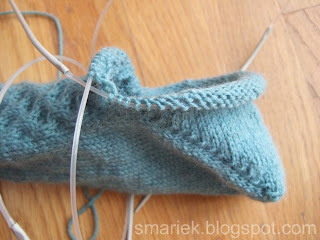 Perhaps start the heel flap earlier so that there will be more gusset stitches. 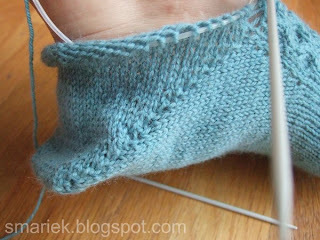 I wonder if I should place a "heel stitch" at the back of the heel so that it will look like a "normal" hand knit sock. I chose K1P1 ribbing for the top; I hope I remember to try smaller needles for this section on the 2nd sock because this turned out loose. I mentioned some increases in the leg portion. Would you believe I eventually ended up with 96 sts on my needles?! 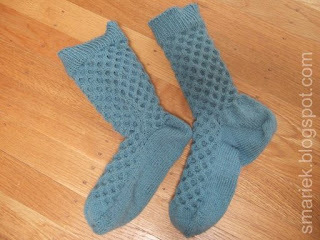 I know it sounds totally wrong after knitting my other socks with 56 to 60 sts on my needles. Hmmm, perhaps I should have stopped my increases at 80. I haven't decided what I'll do for the 2nd sock. The sock has its faults, however overall it turned out ok for a romp-around-the-house sock. The leg is on the loose side now, it'll snug up a bit after washing and a tumble in the dryer.